To mark Family Violence Prevention Month, the government is taking action to increase awareness, support survivors and end family violence. Family violence is an abuse of power in a family, intimate partnership or other trusting relationship where people rely on each other. It can affect people of all ages, abilities, cultural backgrounds, gender identities and sexual orientations. There are resources available for Albertans in abusive situations, including a new user-friendly website that will help survivors find the supports they need to stay safe, no matter where they live. Family Violence Prevention Month started in 1986 as a community initiative in Hinton at a time when family violence was rarely discussed in public. Today, organizations and people across the province are working to prevent family violence. 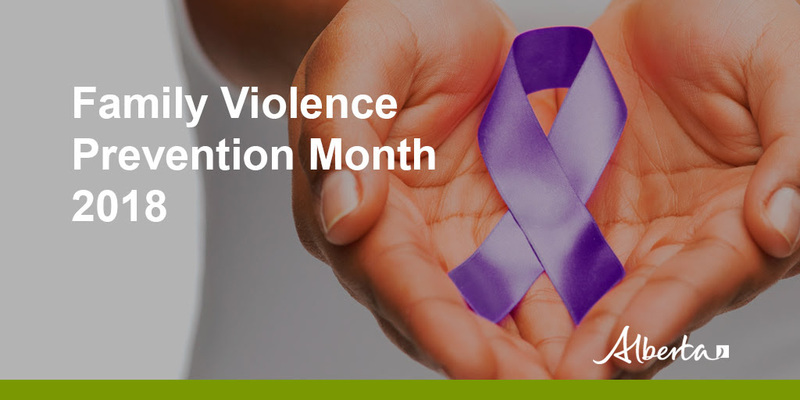 The theme of this year’s awareness month is “Reach Out, Speak Out – Everyone has the Right to be Safe.” Albertans are encouraged to support survivors and increase awareness by wearing a purple ribbon or attending a local event. In emergencies, always dial 911. In non-emergencies, compassionate and trained staff can help 24/7 on the Family Violence Information Line in over 170 languages. Call 310-1818. An online chat is also available from noon to 8 p.m. daily. The new, user-friendly website at alberta.ca/EndFamilyViolence helps people experiencing violence navigate supports. The Safer Spaces program allows survivors of family violence to end their lease without financial penalty. It has helped about 600 Albertans since 2016 and is available at alberta.ca/SaferSpaces. In addition, women’s shelters exist in major cities, rural communities and on five First Nations across the province. This year, an $8.1-million funding increase to the Alberta Association of Sexual Assault Services means more access to counselling and crisis services for survivors of sexual violence. The Government of Alberta also enhanced supports for women and children affected by family violence with a $15-million investment to help make a broader range of supports available, including counselling or other community supports, such as help locating housing or accessing financial assistance. Albertans are encouraged to raise awareness for Family Violence Prevention Month by wearing a purple ribbon, using social media to show their support using #GoPurpleAB and attending a local event.